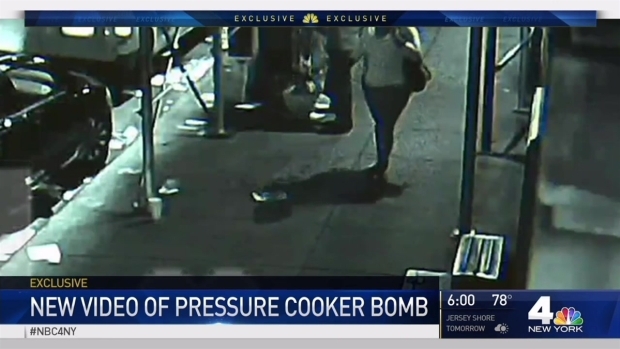 Investigators are looking into whether the man who planted explosives in New York and New Jersey over the weekend took a train into New York Penn Station with the devices, senior law enforcement officials told NBC 4 New York. Officials said it's not yet clear how Ahmad Rahami got to and from Manhattan the night that two bombs were planted in Chelsea. A criminal complaint says that a car belonging to Rahami's family entered the Lincoln Tunnel that night at about 6:30 p.m. and returned at 11:30 p.m. But officials said surveillance camera coverage of the tunnel does not allow them to see who is driving. Officials said that investigators are also looking into the possibility he got to the city by other means, including a train to Penn Station or a car-for-hire service such as Uber or Lyft. It comes after sources familiar with the investigation told NBC 4 New York that Ahmad Rahami likely learned how to build the mechanisms that could trigger a bomb while in community college in the United States. Rahami took an electronics class while a student at Union County Community College, and the sources said he would have learned how to build a triggering-type device while in that class. The college said on Friday afternoon that Rahami enrolled in several non-credit courses at the college that are open to the general public. It said that there was no additional record that he went to class or enrolled in any additional courses. The college added that it is cooperating with the investigation. Rahami faces federal charges that he planted bombs last weekend in New York and New Jersey. One of the New York bombs exploded on 23rd St., injuring 31 people. He remains in a hospital after a shoot-out with Linden, New Jersey police on Monday. One of the questions investigators are trying to answer is whether he had any terror training during a variety of trips abroad. The sources also said that investigators have now spoken to Rahami's wife, who has been traveling for months and was apparently unaware of his plans.